Loxwood's Ash Mutongerwa scored what proved to be the winner in the Magpies 1-0 away win over Langney Wanderers on Saturday. Picture by Steve Robards. 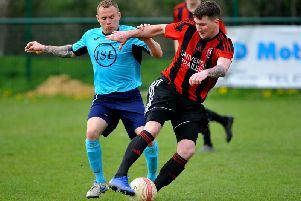 Alex Walsh has called on Loxwood not to ‘take their foot off the gas and relax’ after Saturday’s 1-0 away win over Langney Wanderers lifted them out of the Premier Division relegation zone. Ash Mutongerwa’s tenth-minute strike was enough to seal the Magpies first victory in four and move them away from the drop on goal difference after fellow strugglers Arundel were thrashed 7-2 by AFC Uckfield Town. Walsh said: “It’s nice to be out of the relegation zone but we understand that it’s very tight down there. There’s a certain amount of teams that are down there that could fall in to it. “We’ve been in this position before so it’s not new for us. We’ve been out of it then gone back in it. “We’re not thinking because we’re out of it we can take our foot off the gas and relax. We need to keep pushing on and we’ve got massive games against Pagham and then Horsham YMCA at home so nothing has changed. The visitors got off to a dream start as Mutongerwa’s shot from outside of the box sailed into the top corner past Wanderers ‘keeper Dan Hutchins to give Loxwood a tenth-minute lead. Both sides had chances and Magpies ‘keeper Liam Matthews was called upon on several occasions to prevent the hosts from equalising. Loxwood did look dangerous when on the counter attack but couldn’t find that elusive second goal to put the game to bed. Despite the Magpies being unable to take a comfortable win, they held on to claim a vital three points. Walsh added: “I thought it was a very resolute performance. It was solid. “After losing the four previous games at top-six sides, we knew that this was a big game for us and I think everyone was bang on form. Loxwood travel to Pagham on Saturday. Loxwood: Matthews, Courtney, Parker, French, Boiling, Williams, Cowan, Mutongerwa, Karl, Omofe, Goldson. Subs: Westlake, Magrath, Swaine, Bennett.